Be animated. Using your arms & hands (IE: pointing at your presentation) while speaking helps to enhance the emotion/importance of your speaking points. Step away from the podium, you’re on stage! Look up, and when you can smile. Practice speaking in the mirror, paying attention to your facial expressions as well as the speed and tone of your voice. Pause (3-5 seconds) at key moments such as after a video, a story or a key statement. Have water nearby, you will likely get a dry mouth. Wear what makes you feel comfortable and confident, hit that stage like you OWN it! Use the podium as a comfort zone. Place your hands on the podium to steady yourself. Find people you know in the audience and look at them (for comfort) when possible. Looking at your photographer is another option, after all we want you to look good! Today I had the honour of "shooting" a reception on Parliament Hill celebrating S.U.C.C.E.S.S's 45th anniversary. 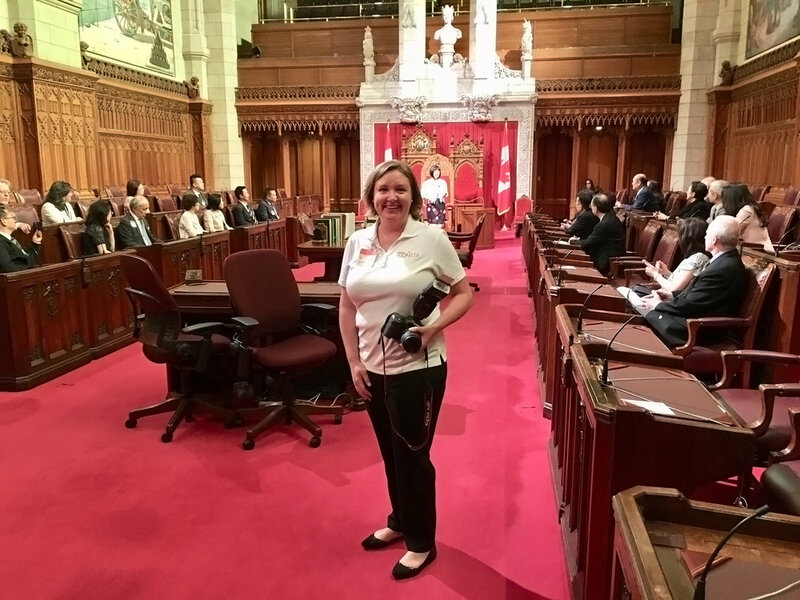 In addition to the reception, Senator Yonah Martin treated everyone to a tour of Parliament including the Senate! Paul Rushforth's annual charity golf tournament is one of my favourite charity events to volunteer my services for. In fact, it is because of this event that I realized my gift for "shooting" events and decided to start iShootEvents! With over 160 golfers; local celebrities; food & drinks on almost every hole and of course a big selection of exciting prizes to bid on, it always produces a ton of fun and lots laughs for everyone in attendance while raising funds for Orleans-Cumberland Community Resource Centre. This past weekend I had the sincere pleasure of "shooting" a 60th wedding anniversary. The happy couple was surrounded by almost 300 of their closest and dearest friends and family. I was extremely touched by the outpouring of love as the guests gave their best wishes. I feel so privileged to have been chosen to capture the memories for them..
60 years of marriage, what a milestone!